Join us on Monday, March 26, at 11 AM for our 8th Annual Charity Golf Tournament! 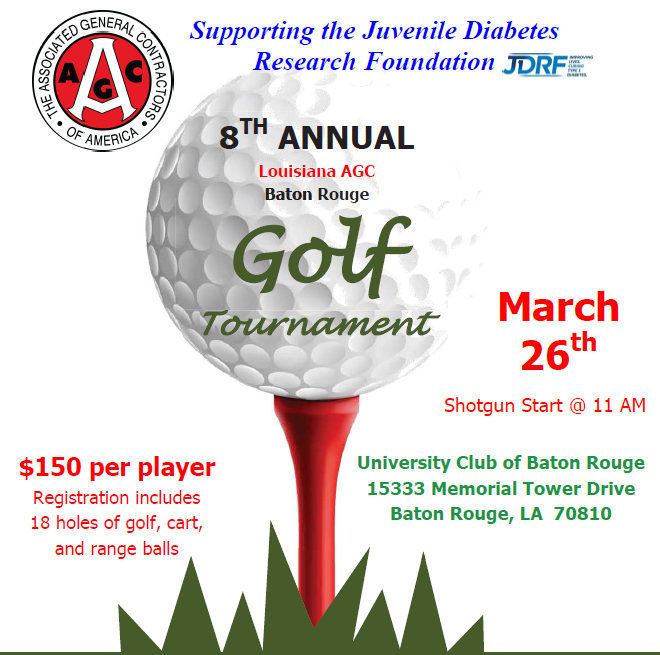 Proceeds help fund the Juvenile Diabetes Research Foundation. Help Support this wonderful cause & Sign Up a Team, as an Individual, or as a Sponsor! *Sponsors assigned to a hole where your company can provide food, drinks, and promotional items to players. Sponsors can be creative with this and have fun. Bring a customized tent, margarita machines, b-b-q pits, jambalaya, etc. ​ *Company Logo will be digitally displayed in each golf cart multiple times at the hole that you are sponsoring.